Good match. This was a straightforward fight with very little in the way of steel cage shenanigans. Ziggler looked good early, but McIntyre began to dominate later in the match. McIntyre made it clear that he was more interesting in hurting Ziggler than winning the match, and that gave Ziggler a small opening late in the fight. I don’t know that they really needed a cage for this, but the cage did add a degree of importance and weight to the match and the result. McIntyre begins to leave after the match, but Ziggler yells at McIntyre. 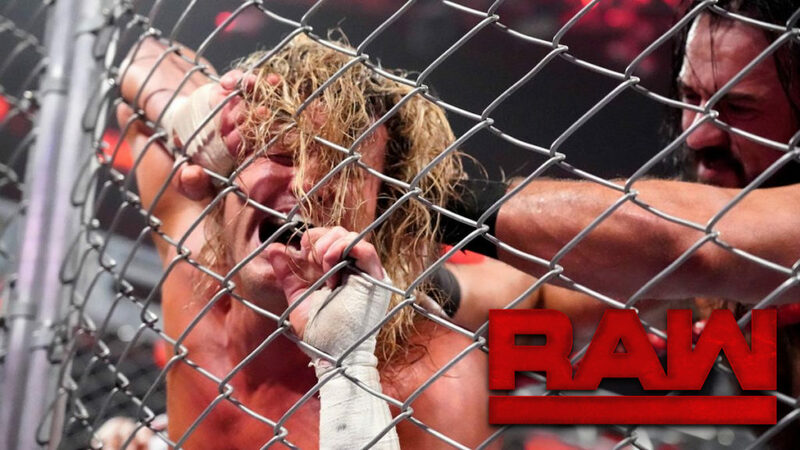 McIntyre calmly grabs a steel chair and kicks it into Ziggler’s head up against the side of the cage. McIntyre then gets on the mic and says e is the king of the RAW jungle. He also says that Ziggler is pathetic dead weight. Now that He has closed the chapter on Ziggler, McIntyre says he can focus on what really matters. He intends to prove he is the king of WWE by winning the Royal Rumble and going on to win the Universal Championship. McIntyre begins to leave again, but he notices that Ziggler has taken the chair from earlier and is now sitting on it in the middle of the ring. McIntyre returns to the ring once again and hits Ziggler with another Claymore Kick. A limo pulls into the parking lot and out step Shane McMahon and Triple H.
A compilation of superstar resolutions. Finn Balor resolves to win the Universal Title. Ember Moon resolves to win the Royal Rumble. The Ascension resolves to win the RAW Tag Titles (though Viktor wants to bring back the Fashion Files). Lucha House Party says 2019 is their year. Seth Rollins heads to the ring. Rollins says he has a rematch for the IC Title, and he wants that rematch right now. Rollins looks up to the stage to await the arrival of Dean Ambrose, but Triple H comes out and heads to the ring instead. Triple H tells Rollins that part of WWE’s fresh start is that there are no more automatic title rematches. Because of that, Rollins will not get an IC Title match tonight. Triple H wonders where the Seth Rollins he once believed in has gone. Rollins wonders if Triple has watched RAW for the last year since Rollins has been carrying the show. Rollins isn’t asking for a title shot, he wants to earn it. Triple H wants Rollins to burn it all down, starting tonight with Bobby Lashley. Rollins says he’ll take Lashley down, and he’ll continue to take down anyone who gets in his way. Including Triple H and his family. Shane McMahon runs down to the ring. Shane asks Triple H to stop antagonizing Seth Rollins, and he tells Rollins to go get ready for his match. Right now, there will be a Fresh Start Battle Royal to determine who will face Dean Ambrose later tonight. This was pretty fun. People were eliminated quickly and almost constantly, but they did a good job of making Apollo Crews look dominant. Charly Caruso asks Apollo Crews what he’s thinking right now. Crews is excited. This is the opportunity he’s been looking for. He can’t think of a better way to spend the last day of the year than by becoming the IC Champ. Dasha Fuentes welcomes Natalya. Natalya isn’t sure what the next year holds for her. 2018 was tough, but there were also great moments. In 2019, she plans to face Ronda Rousey once again by winning the Royal Rumble and challenging her for the tite at Wrestlemania. Nia Jax walks up and says some stuff. The distraction allows Tamina to attack Natalya from behind. In the ring, Baton Corbin complains about losing. He says that he deserves a reward for all he’s done on RAW. Elias appears on the stage, interrupting Corbin. Elias tells Corbin that it’s time for a new years party, and Elias doesn’t invite losers to his parties. Elias goes on to say that Detroit is making a comeback, and Detroit knows what WWE stands for. Elias then plays a song about how Corbin ruined RAW and how Elias will save it. Corbin doesn’t like the song, so the two men brawl. The brawl goes out into the crowd, and eventually Corbin escapes to the backstage area. Drake Maverick says AoP will become more vicious in 2019 and will become champs again. Riott Squad resolves to apply more pressure. Zack Ryder resolves to have more matches on RAW and collect all the WWE action figures. No Way Jose isn’t worried about 2019 yet. There’s still time to party in 2018. Good match. Unfortunately, I feel like I’ve seen this match before. At least, from the Riott Squad’s side of things. The Riott Squad looked great for most of the match. They had superior teamwork and isolated Sasha for an extended period of time. Riott Squad dominated, but they ended up losing in the end from a hot tag and a big move. I mean, it’s a fine match, but I want to see the Riott Squad start winning as a team consistently. A look back at Braun Strowman’s 2018. Seth Rollins is in the ing for a match. Bobby Lashley and Lio Rush come out to the stage. Rush says that if anyone wants a fresh start in 2019, it’s Bobby Lashley. Lashley isn’t here to pose tonight. He’s a fighter, and he came to fight. After he beats Rollins tonight, only then will Lashley show everyone his favorite pose. This was a good match, though the finish and aftermath were more about Rollins’ attitude than anything else. Lashley and Rollins worked well together, and I was getting into the match before the ending. Rush made his presence felt, and though he took some damage, he did end up helping Lashley. All of that just pissed Rollins off though, and his new attitude seems to be to hurt people rather than win matches. At least, that’s what he did tonight. After the match, Rollins continues to hit Bobby Lashley with a chair. Lio Rush tries to intervene, so Rollins attacks Rush with the chair as well. Rollins then hits Rush with a curb stomp before leaving the ring. Ronda Rousey looks angry while Natalya paces. Looks at Lars Sullivan, Lacey Evans, Heavy Machinery, Nikki Cross, and EC3. They’re all still headed to the main roster. This was fun. Jinder didn’t tag in until late in the match, and he took advantage of the Singh brothers’ actions (of mostly getting beat up) to gain an advantage on Rhyno. It was smart, and it was kind of fun to watch. Alone in a dark room, Dean Ambrose says he doesn’t need a fresh start. Rollins needs a fresh start though. He doesn’t look well. Regardless, Ambrose will still fulfill his promise of burning down everything about Seth Rollins. And tonight, Ambrose will ensure that Apollo Crews’ fresh start meets a rotten end. Bobby Roode and Chad Gable resolve to shut up The Revival and continue to make the RAW tag division glorious. The Revival resolves to bring credibility bag to the tag division. Bayley and Sasha Banks resolve to become the first women’s tag champs. Good match. Apollo Crews looked as good as he ever has on RAW tonight. Crews had about 90% of the offense in this match, and it was mostly of the high-flying variety. Ambrose couldn’t deal with Crews, and he had to wait for Crews to make a mistake before he could really get any offense. The finish was a bit sudden, and I’d like to see Crews given a bit more time in a match like this, but those are kind of nitpicks. I was impressed by Crews tonight. Alexa Bliss says we’ve been seeing a lot of changes recently. She’ll miss running the women’s division, but whatever she does, she’ll be making history. Next week Alexa will make history by hosting her own talk show, A Moment of Bliss. Her first guest will be Ronda Rousey. Good match. This was very entertaining, mostly due to the fact that Ronda Rousey was pissed, and an angry Ronda Rousey is a fast and dominant Ronda Rousey. This was a huge change from the slower and hesitant Rousey that wrestled Natalya last week. I like the range of what Rousey does in the ring, and I liked this match. I enjoyed this show. There were some things I wasn’t as happy about (Riott Squad losing again, the IC Title match being kind of short, Baron Corbin still getting air time), but for the most part, this was an entertaining show. There were multiple matches that I quite enjoyed, and there weren’t any full segments that I just didn’t care about at all. This is a good direction for RAW. These are small steps in the right direction, though I just want to see if they can keep this up once Wrestlemania season goes into full effect. Other contenders for match of the night are the main event tag match and the IC Title match. The title match was fun and felt important for Crews, but it was too short. The main event was fun, but it didn’t feel super important in the bigger picture. The steel cage match had a little of all of that, plus it was just a good match. Also, I enjoy it when a show starts with something big and important like that.